Without food, supplies, or a way home, Colonel Everett Young finds himself in charge of a mission that has gone wrong before it has even begun. Stranded and alone on the far side of the universe, the mismatched team of scientists, technicians, and military personnel have only one objective: staying alive. 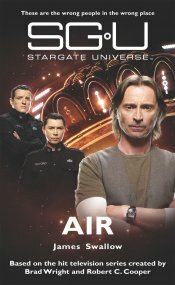 Stargate Universe is the gritty new spin-off of the hit TV shows STARGATE SG-1 and STARGATE ATLANTIS. 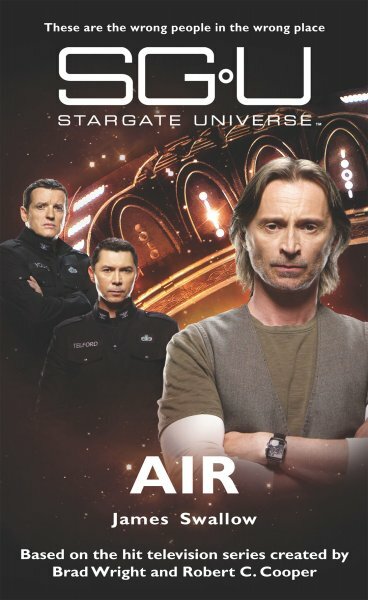 Working from the original screenplay, award-winning author James Swallow has combined the three pilot episodes into this thrilling full-length novel which includes deleted scenes and dialog, making it a must-read for all Stargate fans. Scott took a step and a sullen rumble echoed through the decks. He had the sudden sense of the whole ship tensing around them, like an animal coiling its muscles before pouncing; then a second tremor resonated through, and Scott felt a brief sensation of motion and velocity that faded a heartbeat later. “What the hell was that?” said Greer. The guy took the flashlight and panned it around, and his face changed as he got the first good look at the place they were in. Eli’s mouth dropped open. It was then, just by chance, that Scott noticed for the first time the writing on the t-shirt Eli was wearing beneath his hoodie. It was white text on a red background, some kind of nerd joke, just three words: YOU ARE HERE. Yeah, he thought as he walked away, wherever the hell that is.